The book covers many classical topics in elementary algebra, including factoring, quadratic functions, irrational expressions, Vieta's relations, equations and systems of equations, inequalities, sums and products, and polynomials. 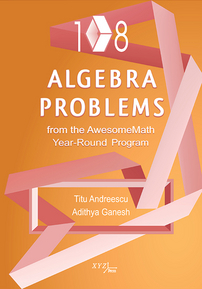 Expanding upon the previous work in the series, 105 Problems in Algebra from the AwesomeMath Summer Program, this book features additional more advanced topics, including exponents and logarithms, complex numbers, and trigonometry. The special section on trigonometric substitutions and more explores seemingly algebraic problems with natural geometric and trigonometric interpretations. To give the reader practice with the strategies and techniques discussed in each of the chapters, the authors have included 108 diverse problems, of which 54 are introductory and 54 are advanced. Solutions to all of these problems are provided, in which different approaches are compared.